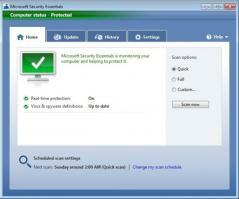 Microsoft Security Essentials is a free security application that offers reliable, basic protection for your computer, against a wide range of threats and flawless integration with Windows operating systems. All essential security functions are included in this free antivirus program developed by Microsoft, such as antivirus scanner, real-time protection, threat removal capabilities and network traffic monitoring. - Real-time protection function issues alerts whenever a suspicious file tries to open, install or run itself. - Multiple scan modes are provided: Quick Scan that verifies only the vulnerable areas of the system, Full Scan to thoroughly check all files and folders and the Custom Scan that can be fully configured by the user. - Threat removal can be set to automatic or to notify the user and allow him to decide what to do. - Complements the Windows built-in firewall. - Detection of unknown and new threats is possible via the Live System Behavioral Monitoring. - Frequent automated update checks using the Dynamic Signature Service. - Includes anti-rootkit detection and removal technologies. - Monitors traffic of the network that your computer is connected to, via the Network Inspection Traffic that identifies exploit attempts and blocks them.